Music at St. Alban’s season begins in September with the first of six great performances. St. Alban’s intimate setting and our fun meet-the-artist receptions erase the barriers between performers and audience, while our expanded outreach programs take guest artists to schools and community organizations, and bring special needs students and others who find it difficult to attend the regular concerts to St. Alban’s for open rehearsals and educational programs. This year’s “spoken program notes” will further enliven the concert experience. We reaffirm our commitment to making great music available to young people this season, and continue to offer free admission to all children under age 12. Your support allows us to keep our admission prices low despite rising costs and curtailed arts funding. Because subscription purchases and tax-deductable contributions account for more than half our operating budget, it is your support that enables us to continue to enrich the community through great music. We look forward to another exciting year of outstanding performances this season with Music @ St. Alban’s. See you there! 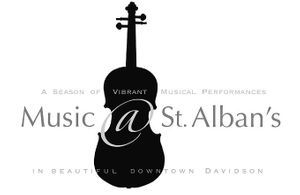 For more information or to order tickets, go to www.musicatstalbansdavidson.org. Tickets are available at the door, or for purchase online. Schedule will be released later in the summer.